I went back to Haven Spa for a massage because I was stressed. Last week I felt so sick. I had so much going on. Fashion week was ending while I was in the middle of a move, I was fighting with my boyfriend, and business was slow. Being so stressed out, I made an appointment for myself at Haven Spa. The last time I had gone there, I had gotten the most relaxing facial. I was in desperate need to relax and treated myself to some downtime. I had opted to get a massage this time. One of the things that intrigued me most about their massage menu is that the names were so unique. Instead of them having the general massages that you see at a lot of spas like “Swedish” or “Hot Stone”, they also had options that are very specific to an individual person. I opted to get the new “Tourist Massage”. The tourist massage is designed for travelers who fly several hours locked in one sitting position, walk miles in a day, stand prolonged hours in lines, carry heavy backpacks or shopping bags, and feel jet lagged or exhausted. Even though I hadn’t been traveling that often, I felt like this was a good choice for me because I do sit all day by the computer, do a lot of walking around the city (in heels), carry a lot of heavy bags, and felt so exhausted. Even though I had already selected a massage, when I walked in the masseuse still had a consultation with me. She asked me about how I was feeling mentally, emotionally, and physically. She also asked me about my daily routine and if I had anything coming up or going on in my life that may cause my stress on my body. I got to spill my issues on her, and she helped me clear my mind of them. My massage session lasted 90 minutes and focused on my feet, legs, lower back, shoulders, neck, and head. It included stretches as well as hot and cold applications. I fell asleep halfway through and felt totally zenned out. I left feeling so much more relaxed and also extremely optimistic. It’s amazing how much better my body feels and how that changed my entire attitude. 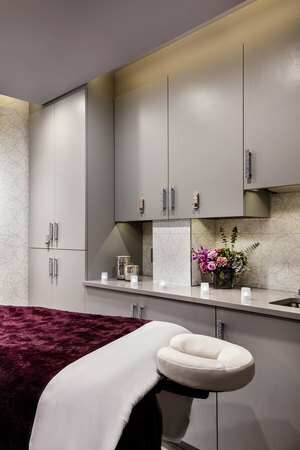 I highly recommend you check out Haven Spa and their dynamic menu of services. You won’t regret it!